I wanted to make a vegan cake for someone’s birthday, but most vegan desserts usually contain some grains or processed sugar, which I try to avoid, being Paleo. On the other hand, I do use eggs for baking, but that’s not vegan, right? I also wanted chocolate, thank you. This cake was gone after a day! combine first 4 ingredients in a food processor or blender. Blend until sticks together. You don’t want to turn it into a powder, but you don’t want any whole pecans in there either. Once blended, press the mix into a pie plate. You don’t have to butter the pan. Set that aside and make your filling. Add the remaining ingredients into the food processor or blender. Once ingredients are completely blended together into a creamy consistency, pour mix into the prepared crust. Set in the fridge to chill until serving, or if making ahead, freeze and serve at a later time, but thaw at least an hour to room temperature before serving. 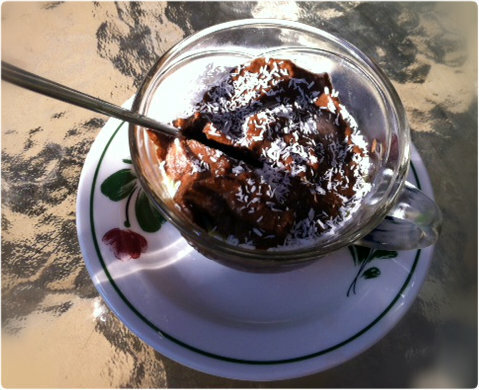 This is a great dessert for a warm summer night, it’s cool and light. Only problem is, it’s so tasty and such an easy pie to make, that it’s tempting to make again and again. Bon Appétit! Every once in a while, I crave sweet, like all normal people. I especially want my CHOCOLATE. I love chocolate. Usually I’ll have a few squares of 85%-90% cacao chocolate, like Lindt, or Green & Black Organic. 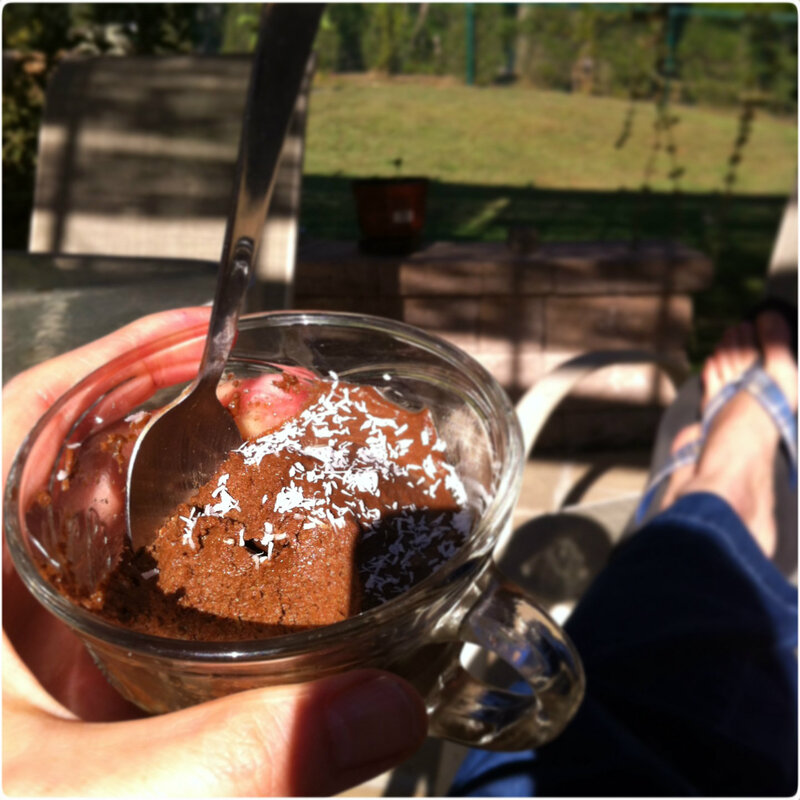 Yet, sometimes, I just need to feel the soft, creamy, chocolaty, mousse-like texture on my tongue. 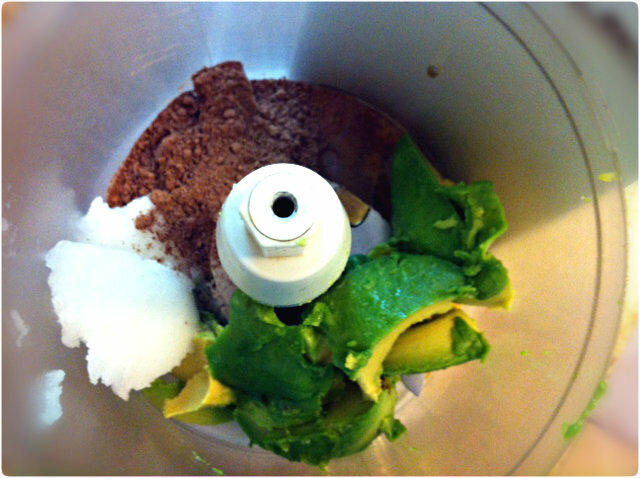 With a spoon, scoop out all the avocado, sans skin and seed, into a food processor. Lick the spoon, it’s good for you. Add the other ingredients to the food processor. Start processing by pulsing on high speed, until the mixture is homogeneous, in a creamy-like consistency. You do not want to see little specks of avocado. Everything has to look like brown, chocolaty, unified pudding. At this point, you may transfer the cream into a nice container, and cool it for 10 minutes in the fridge. Or, I just finish it off right there and then. 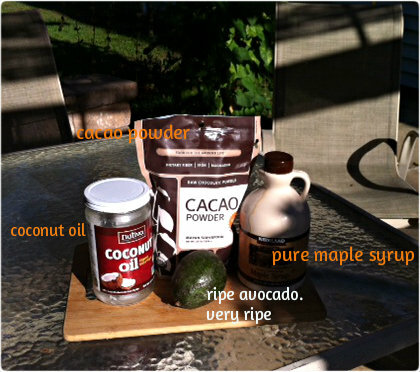 coconut oil, cacao powder and maple syrup- you want them of high quality, preferably organic. you better blend the mixture well, or else you’ll have green avocado specks. While that’s not too bad, try to explain that to your guests. Personally, I don’t go after a very sweet kick, a little will go a long way. Being Paleo kind of lowered my sweet-taste lever, so 2 TBS of maple syrup are enough for me. You may need to add maple if you like it sweeter. This is a basic recipe, but there are many add-ons that could elevate your pudding for a festive occasion or just to fancy it up. Add any one of these to the food processor: 1/2 sp. pure vanilla extract, 100 g of melted chocolate bar, chopped nuts (almonds, walnuts, macadamia, etc. ), shredded coconut (I used it on top, to garnish), chopped dates, chocolate chips, chopped banana chips, whatever makes you happy. do not refrigerate the pudding for too long, as the coconut oil tends to harden. I first noticed these sweeties at the Indian store. Of course I bought them, and they looked and tasted yummy. Online, I found this recipe, but have decided to make mine a little different, with the ingredients I had at home, and no butter. These are gluten free, but if you don’t care, you can add wheat, oats and more, to your taste. I usually chew down a few balls right before I start my run, for a boost of energy. Now- you’ll need to excuse the lack of exact quantities, as I made them without measuring. throw walnuts + pistachios + almonds in the food processor, and chop chop- yet- not till it’s powdery, but way before that, when the mixture has small chunks that you would feel in your mouth. 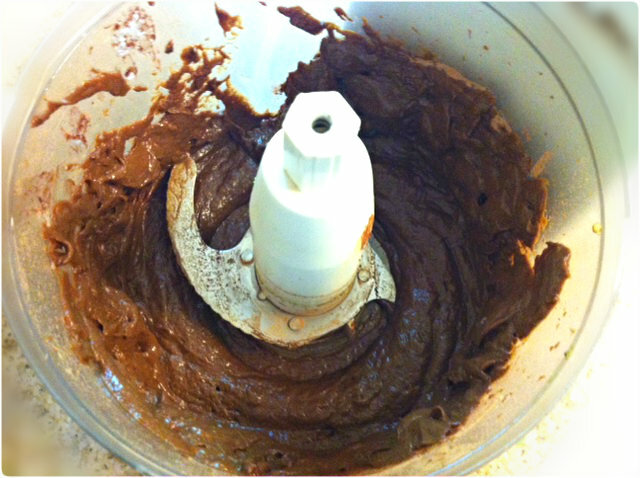 add dates + tahini + honey (or silan), and mix till it’s blended to a nice, soft mixture that kind of sticks together. If you feel that it falls apart, add more dates and a bit of honey. with hands, roll mixture into little balls, place on a tray and into the freezer they go. Take out or move to the fridge for a softer bite. * date mixtures can be found in specialty cook stores or any middle eastern or indian stores. I find the regular pitted dates to work great ! ** silan is honey made from dates. Can be found in the kosher isle of some stores. Reg. honey will do !! ***finally, add-ons: almost anything yummy can be added to compose a real good snack: cocoa powder, coconut powder or flakes, any kind of nuts, puffed kamut/rice/wheat, chia, quinoa, corn flakes, old dried cookies, sesame seeds, etc. Also, instead of dates, you can put figs, or a combo of both.